Jarett Kobek’s new book BTW will be released next month from Penny-Ante Editions, and Vouched SF has things up our sleeves. Exciting things! Things that will make your hearts hot and tight. For now, we will just tease you with this weird and beautiful book trailer. As I drank my coffee Sunday (yesterday) morning and skimmed through online journal world, I happened to return to Jellyfish issue 9. A month or so ago, I read the poems by the poets who I was familiar with, but skipped over the names with whom I was unfamiliar. I’m glad that I came back to the issue because it provided me with the opportunity to read, for the first time, the poems of Christopher Robinson. Both poems address an element of the natural world (the former indirectly, the latter directly); but, more interestingly for me, the rhythm and tone of Robinson’s poem seems to echo or resonate with the Niedecker poem in way that I’m still thinking through. Either way, it’s a gorgeous conclusion to a wonderful set of poems. I highly suggest checking these poems out. Also, I’m off search-engines until mid-to-late April 2014, so if anyone has any links to more of Robinson’s poems online, please post them in the comments section. I didn’t think I was actually going to read “Salsa Nocturna”. I definitely knew I was going to buy it, though. I’d heard too many good things and I wanted to have that book. I wanted to at least try to read it. But there was a problem: ghosts. Not just ghosts, but half-dead men, giants, and creepy porcelain dolls. I’m no scaredy-cat. I love horror films, even the bad ones. Still, reading horror hasn’t really been my thing since R.L. Stine, Christopher Pike, and “Stories to Tell in the Dark”. As an adult, it’s been hard for me to get into the stories and experience them the way I assumed the author intended. The same was true for sci-fi and fantasy. I’ve passed over these genres in favor of non-fiction and realistic fiction on countless occasions. Then, I saw the title of this book pop-up over and over on my social media accounts and in a few blogs I follow. 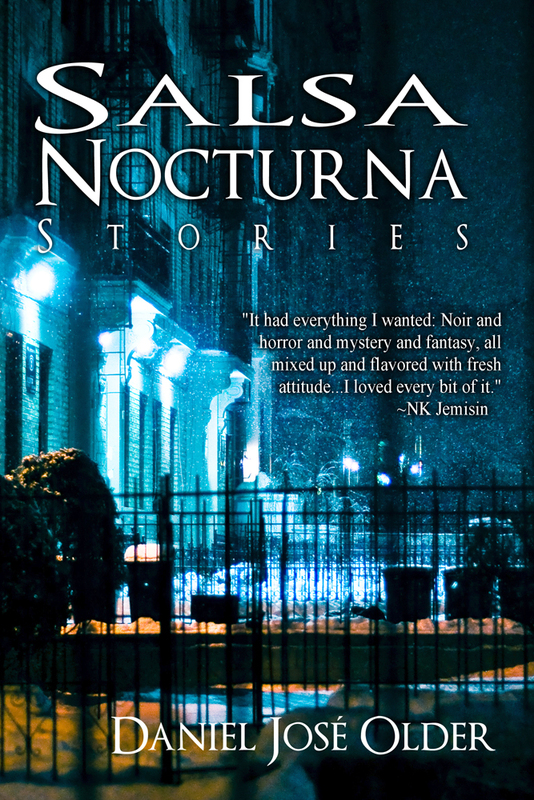 “Salsa Nocturna” is a provocative title and I was intrigued by all the buzz. I ordered it from Crossed Genres with hope, but certainly, a lack of faith. When “Salsa Nocturna” arrived, I sat down and cracked it open immediately. I knew myself well enough to know the longer I waited to do so, it would become less and less likely I ever would. And of course, this is the part where I tell you I didn’t put the book down until I finished it. I was more than pleasantly surprised, I was enthralled. Daniel José Older writes about supernatural occurrences in a way that allows the reader to embrace the story without suspending belief. This series of stories is about more than horror or any other label you could slap on a collection confined to its genre. There are moments I laughed out loud because they were so funny and so authentic. In some ways, I was jealous, unsure that I’d ever been so real in my own writing. And I write nonfiction! In other moments, Older’s stories made me want to cry out of frustration or longing to experience love the way he’d written it between those pages. I would be remiss if I didn’t mention that it was really very refreshing to read a book with such a diverse cast of characters. Older’s characters exist on every plane between the living and dead. They are robust and bursting with life even when they aren’t exactly…alive. In fact, I would venture to say that the characters who are least alive are the ones who perform the most profound exhibitions of humanity. Carlos and Riley being my favorites, it is especially satisfying to read through their character development. What does it mean for the dead (or half-dead) to embrace his/her sense of moral or ethical responsibility? And what does it mean when that sense of responsibility puts him/her in direct opposition to the powers that be in this world or the next? Older answers those questions, not with clear-cut responses, but with stories that make you long for the certainty that your death will be more adventurous than your life, that you might have the opportunity to answer those questions with your journey beyond, that you might even dance right into the last phase of your humanity.